The Birmingham Dribbler was a classical toy Victorian era. It was made by many different makers to a basically similar design. This example is a (comparatively) modern reproduction made by Maxwell Hemmens in the 1980s or 90s. Although representing a railway loco, the Birmingham Dribbler is intended to run directly on the floor without any track. This is made evident by the front wheels being steerable so that it can be made to run in a circle without tracks. The wheels are flanged but this is for visual effect only. The loco is very simple, consisting of a 2-2-0 wheel configuration, the rear axle being driven by a pair of single-acting oscillating cylinders. 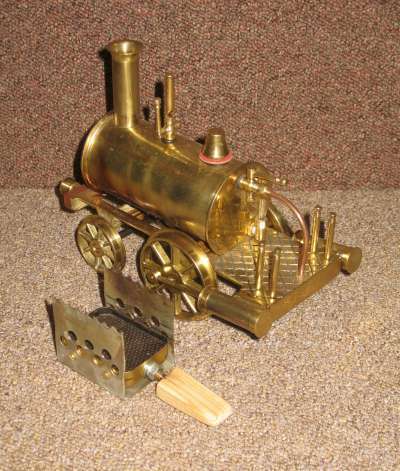 It is mainly brass with a few steel parts where appropriate, a copper steam pipe and a wooden buffer beam at the front. There is no buffer beam at the rear. The burner is a tray slung underneath the boiler; originally designed to contain a solid fuel tablet but modified so that it can use meths. (The original Victorian examples would have used meths). The boiler is 2" diameter x 4"long. It has water level plug at the front and a water level glass at the reat end. It has a dummy chimney, whistle and safety valve on the top. It has a regulator valve mounted at the rear with the steam feed pipe directed down to the two cylinder port faces under the footplate. The two oscillating cylinders are mounted on the footplate, behind the driving wheels. They are single acting but with the end closed to look like double acting. There is a small hole to allow air into the unused half of the cylinder. The cylinder dimensions are approx 7/16" bore x 7/8" stroke. The driving wheels are 2 5/16" diameter and the leading wheels are 1 5/8" diam., including the flanges in both cases as the engine is meant to run on the flanges. The leading wheels are steerable. The loco could probably be run on 2 1/2" gauge track if desired. The condition, as acquired, was unused. It was advertised as new but it had been sitting unsold for about 35 years! It had a slight patina on the brass and even a few spots of verdigrise in odd corners of the under side. After a few successful runs, one of the cylinders siezed solid. On inspection, it was obvious that the hole for the trunnion screw was drilled right through into the cylinder! Hence, if the trunnion was screwed in more than 4-5 turns, it hit the piston! At the time I couldn't see how the cylinder came apart easily. It was eventually repaired by a friend, and both cylinders modified so that it wouldn't happen again.